With Thanksgiving just around the corner, I don’t have much time to go on about how this pregnancy has been the most challenging of the three, nor how I’ve been having way more successes than failures in the kitchen throughout the past month, nor how after almost two years of owning a laptop that was about to give in, it finally did give in, but fortunately we were able to save up for my new HP beauty rather ahead of time which, believe it or not, brings me far more joy than it probably should, nor how I was very reluctant to share this recipe with you all. Some things should be kept a secret. And this one, fortunately, is not one of those times. If you know me in the least bit by now, you know that I tend to be generous with words of encouragement. If it serves as encouragement at all—and I mean, I truly do hope you give this recipe a chance because it has to be the best pumpkin pie known to mankind—I’ve been mulling over the idea of even attempting this version of pumpkin pie for nearly 8 years. It was frightening to think that I could fail at it, but I tried. And you know what? It has been utter success in the Betzen household ever since. A copycat it is, and it hails from the kitchen of Urth Caffe—probably my favorite go-to spot in the grand metropolis that is Los Angeles. In order to attain that enchanting flavor and texture of their signature crust I figured that Biscoff cookies would do the trick. Not only that, but the addition of molasses and honey give it the most ethereal, profound dimensions within every bite and, to top it off, the filling is superlatively rich and dense compared to other pumpkin pies I’ve tried in the past. Keep in mind that including spices like cardamom will surely do your outcome much good, but you can go without it just the same if it becomes a burden to purchase another bottle of ground spice. They tend to get pricey, after all, and I am all about helping your financial cause. 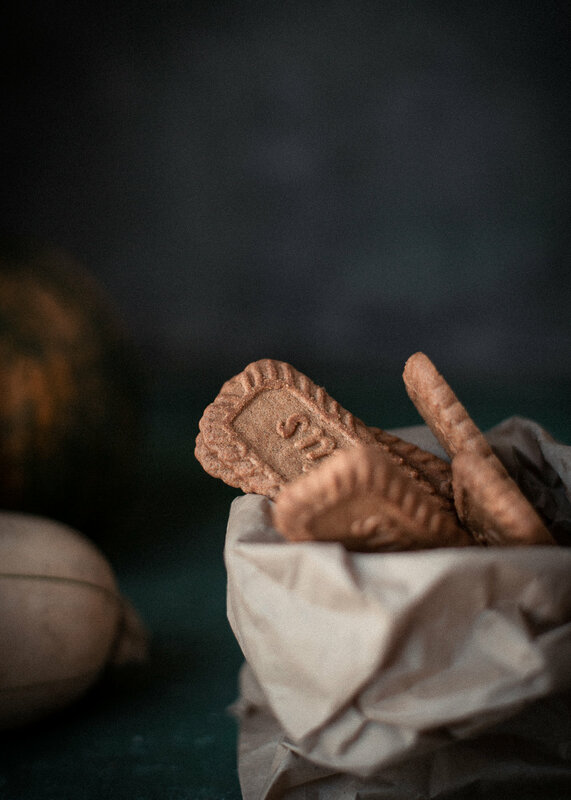 Crush Biscoff cookies as finely as possible. You may use a food processor altogether, or you can use my more tedious but satisfying method: fill a gallon ziploc bag with the cookies and crush away with a cast iron skillet. Literally put your back into it! Transfer to a mixing bowl and mix the dry ingredients first, followed by the wet ingredients. Using a wooden spatula, mix and mash thoroughly (I love to use Polder’s OWM wooden spurtle because it makes it really easy to mix and keeps my counter free from stray crumbs). Evenly spread the crumb mixture onto a 10 inch pie pan. Press with palms and fists onto the bottom and sides. Don’t be afraid to make the sides a bit thick because that’s one of Urth’s signature qualities in their pies. Set aside. You may even freeze or refrigerate with a tight seal. ***You may use canned pumpkin puree, but if using fresh pumpkin, particularly the large kind, follow this set of directions. Try to make it way ahead of time to cut down on the work, and then you can also freeze whatever remnants you have. Preheat the oven to 425F degrees. Line a large cookie sheet with parchment paper and roast the pumpkin with skin-on for approximately 60 minutes. Break it off from the top, scoop out the stringy flesh along with the seeds. Scoop out the meat and pulse in a processor, or mash with a potato masher. It should be okay as long as you’re able to mash it very fine. Drain out whatever excess water may remain. This depends on the pumpkin you use. Preheat the oven to 400F degrees. For the filling, mix the pumpkin, yolks, vanilla, salt, and spices in a large bowl. Then place the cornstarch in a liquid measuring cup. Pour just a glug of evaporated milk, mix it with your finger to form a thick paste. Then pour more milk until it reaches the 1 cup line and mix once more. Add this to the pumpkin filling mixture. Then add brown sugar and mix. Pour the pumpkin filling into the prepared crust. Just barely place aluminum foil on top of the pie (do not seal it) to keep the crust from burning. Place a large baking pan on the middle rack of the oven. Place the pie in the middle of the pan. Pour water around the pie so it comes to about half way up. This is called a bain-marie which keeps a nice, even cooking all throughout. Bake at 400F for about 30 minutes. Then raise the temperature to 450F and bake for about 18 minutes. Carefully take it out of the bain-marie. Set aside and make the meringue, which is optional. Whip cold egg whites with a beater or in a stand mixer until it becomes slightly foamy. Gradually add the sugar and keep whipping from medium up to high speed until peaks begin to form. Add the extract and cream of tartar. Keep whipping until it becomes a solid stiff peak. With any piping tip of your choice, poke it through a strong ziploc bag corner and pipe it as you wish onto the pie. While you can definitely use a culinary torch, you can easily get the golden meringue effect by placing it in the oven at 500F degrees. Bake for approximately 5-7 minutes, or until the top is golden. 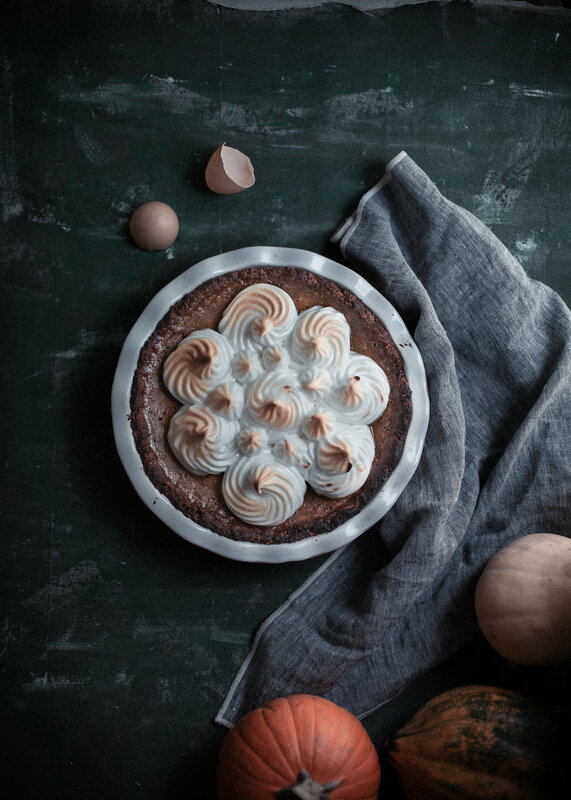 Let the entire pie cool down for at least 5 hours or overnight, or you can refrigerate it a little earlier and do the hot oven method with the meringue when you’re about to serve the pie. This giveaway will run for 5 days. Best of wishes and many blessings!